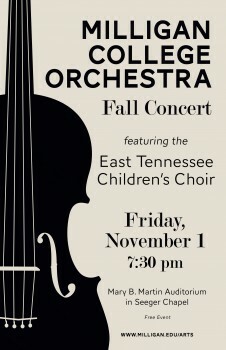 MILLIGAN COLLEGE, TN (Oct. 18, 2013) — The Milligan College Orchestra will present a fall concert on Friday, Nov. 1, at 7:30 p.m. in the Mary B. Martin Auditorium of Seeger Memorial Chapel. The concert is free and open the public. The highlight of the concert will be the Mountain Empire Children’s Choral Academy (MECCA). Under the direction of Jane Morison, MECCA hosts the premier choral ensembles for children and youth in the East Tennessee and Southwest Virginia region. The East Tennessee Children’s Choir, MECCA’s largest ensemble, just celebrated its 25th anniversary, a milestone that will be honored by Milligan through the collaborative production of the beautiful and moving work “Veni Sancte Spiritus” by composer Kentaro Sato. The Milligan Orchestra performs throughout East Tennessee and Southwest Virginia and collaborates frequently with professional ensembles and arts organizations, including MECCA, The Civic Chorale, the Johnson City Symphony Orchestra, the East Tennessee Regional Symphony and the City Youth Ballet. In addition, it is the pit orchestra for various opera and musical productions at Milligan and serves local churches in ministry. The orchestra also champions new works and has performed the world premieres of numerous pieces including “Three Genres” by John Grubb and “Genesis” by internationally renowned composer Kenton Coe. Posted by tommy on October 18, 2013.